In this installment of In our LivingRoom home tours we were thrilled to visit Ted and Sharon Burdett of Strand Design and their inspiring studio condo at the iconic Marina City. This dynamic duo designed, renovated, and built custom cabinetry and furniture to maximize space, create efficiency, and live in a modern and serene home. We hope you enjoy this tour, and if you wish you could live there you are in luck as LivingRoom Realty will be listing this beautiful condo soon! LivingRoom: Tell us about your property? T & S: Our condo is located on the 47th floor of the east tower in Marina City, facing northwest. It's a 500 sq ft. studio —with a 150 sq ft patio —which is really one of the most defining characteristics of Marina City. When we purchased this unit, it had been a rental for over thirty years. It hadn't been given any TLC for a very, very long time, and we had to gut it entirely. Nothing was salvageable. We treated the space as a testing ground for our design ideas, and have actually built and rebuilt many of the pieces that are now part of the apartment..
LivingRoom: What were the deciding factors when choosing your area and picking your property? T & S: We've always believed in the philosophy of location, location, location. As two very busy people who were running a business together, we didn't need an enormous amount of space, since most of our waking hours were spent outside of the home. We just wanted something that would help make life easier, and bring a lot of enjoyment to us every day. Marina City is located in the center of the city, right on the Chicago River. We've enjoyed the incredible views, daily walks on the riverwalk, the ease of being able to walk everywhere to get everything we need, and the access to transportation. We knew that these things would make things easier on us, and they certainly have. LivingRoom: What’s your favorite thing about your property? T & S: You really just can't even believe how awesome the balconies are. It feels like you are inside of your own private opera-box with the ultimate view of the city. I've also been able to walk to work every day for the last five years. LivingRoom: What would you tell someone who is embarking on the buying process? T & S: Be honest with yourself. What are the things you can compromise on, and what are the things you cannot? We were able to compromise on space, but not everyone may be able to do that. We knew that convenience, access, and the daily enjoyment of the city were the most important things for us at the time. LivingRoom: Tell us about yourself? LivingRoom: Tell us about any improvements you made or plan to make and why? T & S: Well, we had to change almost everything in this apartment, so I'll focus on the things that we think make the biggest difference. Installing a glass door. The windows are so beautiful and give you that seamless curtain of glass, but the standard doors are solid. We installed a glass door and it was huge improvement. The whole space is filled with light, it also allows light to travel down the hallway. Installing a murphy bed. This is a real gamechanger, and allows you to actually have a living room. Making the closet into a desking area. We wanted to have multiple "zones" in the space, and the hallway closet is really huge considering the size of the space. We modified the wall, removed the door, and installed lighting so that it could become a "mini-office." Using an under-counter refrigerator. A full-size refrigerator just looks absurd in these units. With an under-counter fridge, you get more counter space, and better sight lines. LivingRoom: Can you tell us about that process? T & S: As two designers who had a practice of building furniture together, this space was a mini-laboratory. In much of our work at Strand Design, we focused on utilizing urban lumber, and we continued to do so in our apartment. Almost all of the wood that you see in the space is salvaged ash from the Chicago urban forest. LivingRoom: Well thank you so much for sharing your beautiful home with us! If you want to see some before pictures check them out here. Dana Lewis and Sam Vinz were looking for a place they could call their own in the West Town area. Working with Sarah Frier at LivingRoom Realty they found a perfect bungalow they could transform into a light and art filled dream home. 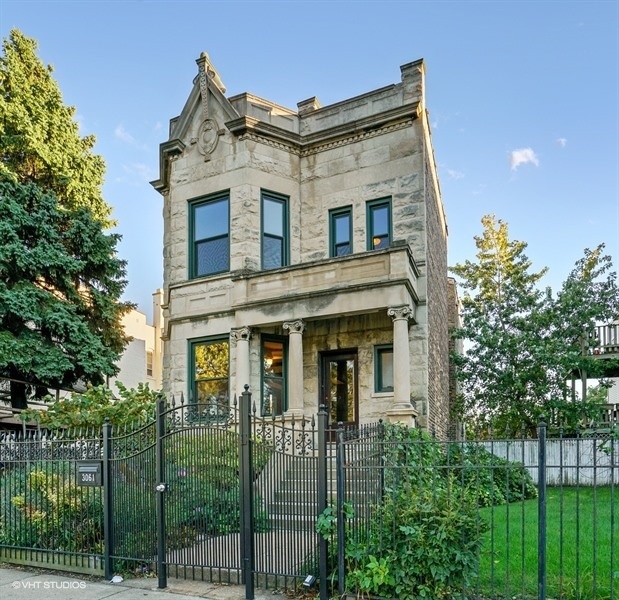 Dana: We bought a 1890 one story 750 sq ft bungalow in Humboldt Park in 2014. 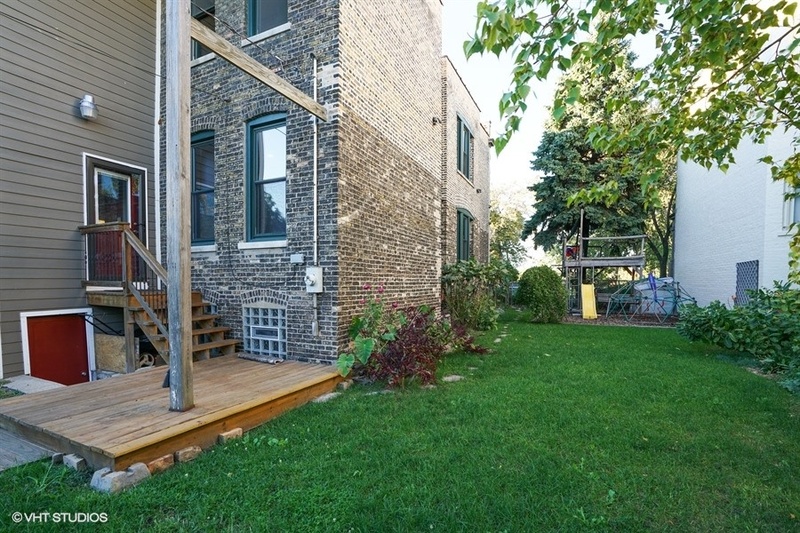 It is a standard Chicago lot size. The house had not been updated/renovated in quite some time (many decades). It was a one bedroom/one bath with separate garage and unfinished basement. We knew when we bought it what it would be big renovation project. Dana: We had looked at so many properties and could not find anything that seemed like the right fit for us. We were open to the perfect condo, single family or a multi-unit that was in our price range. The more we looked, we realized we would be paying for renovations that did not match out aesthetic. When we found our house on an MLS listing we thought it seemed like a unique property and worth checking out, especially after seeing so many places and listings that looked so similar. We went for a second visit and brought a contractor who thought the best approach for adding space and renovation would be to add a second floor rather than finishing the basement or extending the length into the back yard. We then had an inspector out to make sure the foundation could support a second floor. Once we got the ok from the inspector we made an offer and got the house. Sam: It got to be really difficult to walk into a condo/single-family/multi-unit that had just been redone in a bunch of awful standard materials. All of that is factored into the price of the home. The ‘contractor-special’ is not really our vibe - so to pay a premium for those finishes was not appealing to us. Dana: Very quickly it became apparent that we were best suited for a place that needed a little love. Which is what we found in this house - it needed a lot! Dana: This the first time either one of us has owned a property. It’s so much more quiet than living in an apartment, which is nice. It’s also great to have a yard for entertaining. We plan to design the yard for an optimal entertaining space next year. It’s also very nice to be so close to the park. There are great restaurants, coffee shops and bars a 5 minute walk away. Sam: Agreed, while much harder to create a space in that manner that we did, settling for something less would have left us both unfulfilled. We rented in Ukrainian Village for 4 years before buying our home. We love to travel and met while traveling in Mexico City in 2010. I am an Emergency Room Nurse Practitioner and Sam owns Volume Gallery, a contemporary design gallery in Chicago. Sam: We need to do things in stages. First stage is the house, second stage is the yard, third stage is the garage. Dana: Once we bought the house we rented it out on AirBnB and a 6 month lease which was great because we were able to cover the mortgage while get got everything in order for the renovation. It took about 15 months to get the plans, permits, hire the contractor, loan, etc. Since Sam owns a design gallery, he knows a lot of people in the Chicago Architecture world. We asked our friends Carrie Norman and Thomas Kelley of the Norman Kelley Architecture firm if they would like to design our home. They accepted the job and we are very grateful for all their hard work, patience and dedication. We collaborated with them for the basic concepts of what we were looking for- an open space ideal for entertaining, 3 bed/2.5 bath, a large skylight in the stairwell, an overall modern looking design. We interviewed several different contractors. We basically went with the most affordable option, Walsh Custom Homes and Jim Walsh was great and I would recommend him to anyone without hesitation. I don't think many people can say that about their contractors. We started construction in January of 2016 and moved in August 2016 with no floors, kitchen, dry wall not completed- basically we had plumbing and electric and that was enough for us to stop paying rent and move in. We worked everyday after work and every weekend for about 5 months. Luckily, Sam is very handy so he put in all the floors, kitchen cabinets, bathroom vanities, trim for the floors and painted the entire interior of the house. We hired someone through our contractor to install all the tile. We tried to be as resourceful and economical when finding materials we wanted. We also wanted to support smaller business and stay away from the Home Depot type stores as much as possible. We got wide plank pine for our downstairs floors from a lumber company in Wisconsin. We got 10 ft solid wood doors from salvage place in Milwaukee. We used a small company in Glen Ellyn for our soap stone counter tops and they are also carpenters so they hung our doors and did an excellent job with both. We hired amish from Wisconsin to make and install our built-in closets. We spent many weekends going to tile outlets, salvage yards, estate sales, habitat for humanities, etc looking for what we needed. We still have several projects to finish, but have been living comfortably and loving our space since getting the bulk of the project done by December 2016. Meet Aaron and Vincent, two new homeowners with serious artistic vision. 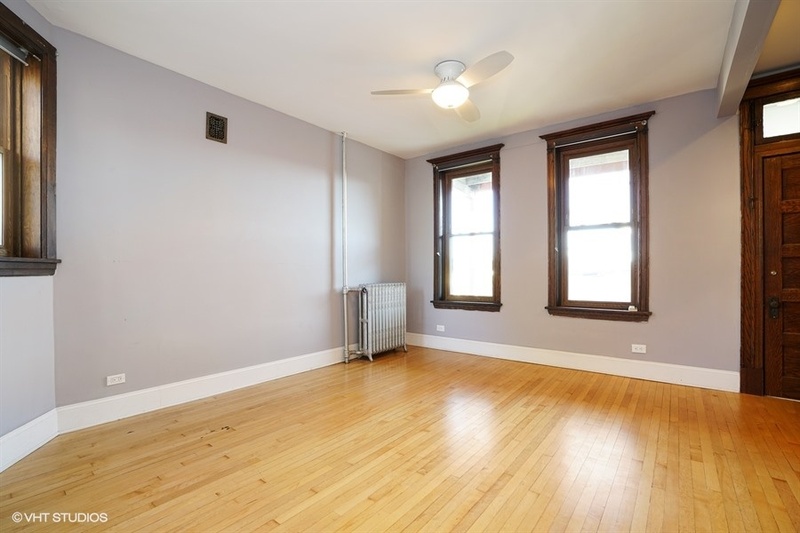 Aaron and Vincent recently purchased a three bedroom, two bathroom home in East Garfield Park with the help of Susannah Ribstein and Annie Coleman of LivingRoom Realty. Both are Chicago transplants who were captivated by the city and couldn’t imagine leaving now. Aaron is the Director for Operations for Dynamism, Inc., a Chicago-based technology distributor focused on 3D printers and scanners. Vincent is the Art Director of a nonprofit that supports adult artists with disabilities: Arts of Life. He also runs LVL3, a gallery and online publication supporting creative talent from all around the world. They are also the parents of a beautiful cat, Rox and an impressively photogenic pitbull named Milo. We asked them a few questions about their journey to homeownership. LivingRoom Realty (LRR): So, what were the deciding factors when you were selecting a neighborhood and picking out a property? Aaron & Vincent (A&V): One of our primary concerns was being close to work. We were both coming from super easy commutes and didn’t want to change that. We were lucky enough to find a place that's almost directly in between both of our day jobs--our commutes are really only about five minutes. We also wanted to make sure that we would be able to access a grocery store, a gym, and our friends fairly easily. We did not want to go to the suburbs! LRR: Can you explain a bit more about that process? A&V: Our initial goal was to buy a commercial building, start a business, and live above it. After months of trying and several business plan drafts later, the process for financing proved too difficult to secure the property we were initially after. We eventually began looking strictly at residential homes, but came across a lot of bleak looking properties that needed tons of work and were at the top of our price point. We actually overlooked this property at first, but are ultimately very happy with it. LRR: What made you choose this particular home? What’s your favorite thing about the property? V: I love having a finished basement. We can hang out down there, watch movies, and display our art collection. The basement also serves as a private guest space when friends and family need a place to stay. We also wanted a large closet and were able to turn a whole room into a closet here. A: Natural light is super important to me, so the fact that the kitchen and our bedroom both get a lot of that was a big factor. 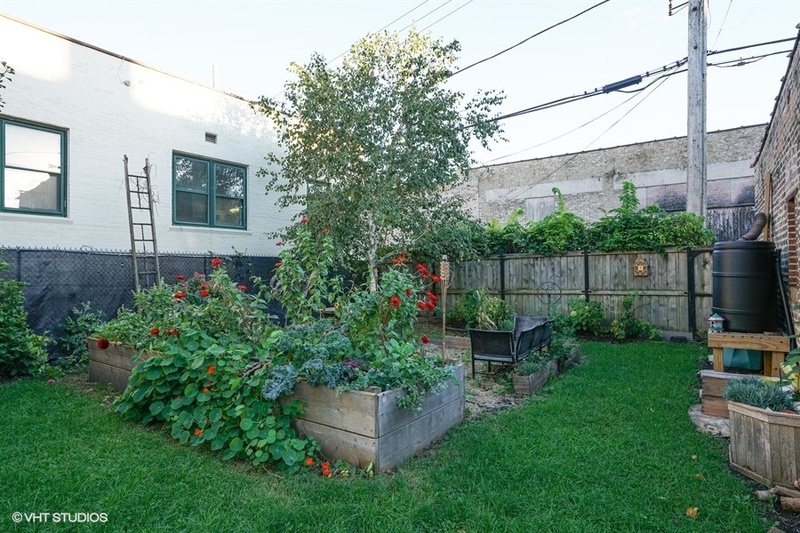 Also, having a space to garden (we have an extra long lot) is huge. LRR: After going through it yourselves, what would you tell someone who is about to embark on the home buying process? A&V: Don’t rush into it; the right property will come about in time. It’s easy to get excited about a property or feel like there's nothing out there worth your time, but it’s important to avoid settling on something you aren’t thoroughly excited about. Have a good idea of what’s important to you in terms of property characteristics, but also keep an open mind about what’s going to work realistically, and be honest about your lifestyle and needs. Obviously, finding the right agent is also crucial! LRR: How did you incorporate your own style into the home? Tell us about any improvements you’ve made or plan to make. A: We honestly didn't have to do much to the house since it had been renovated shortly before we bought it. The biggest things we did were paint the entire interior of the house ourselves and swap out all of the light fixtures to match our aesthetics better. If we could have done that over, we definitely would have hired professional painters as opposed to two people who could help us paint. That was really challenging. V: We hope to add some curb appeal to the house and paint the exterior (at least the front) in the next few years. We have lots of plans for the front and backyard. Aaron’s planning a pretty complex garden, and I’m looking for ways to host backyard gatherings by adding a projection screen, fire pit, barbeque, and outdoor furniture. Thanks to Aaron & Vincent for letting LRR into their living room! Join us at LivingRoom Realty on Saturday, September 29th from 6 to 9 pm for the opening of Marianne Fairbank's solo exhibition, "More Air-Like Than Water." The work presented in More Air-like than Water explores the deep meaning in geometry and abstraction as they relate to textile and graphic design vocabularies. Fairbanks approaches weaving, painting, photography and sculpture with a playfulness of process that destabilizes conventional value systems of hard and soft form-making while digging into more philosophical understandings of material vs. immaterial. The viewer is asked to consider object as photo, photo as pattern, pattern as dimensional. Confronted simultaneously with macro and micro, foreground and background, the view is disoriented as they search for a focus. While the work fights for perceptual attention, it also encourages a deep engagement with our material world in the construction of philosophical belief systems and physical realities. For more information about Marianne and her work or to schedule a showing, please visit her website. Closing Tea: Saturday, October 27th from 1 to 4 pm at LivingRoom Realty. 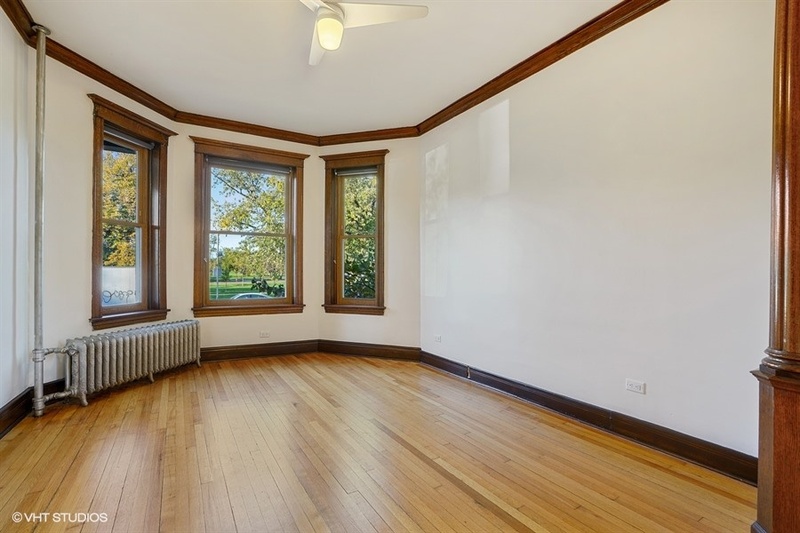 Come and see this 2 bedroom/2 bathroom condo with a welcoming open floor plan, located right on beautiful Palmer Square Park in Logan Square. 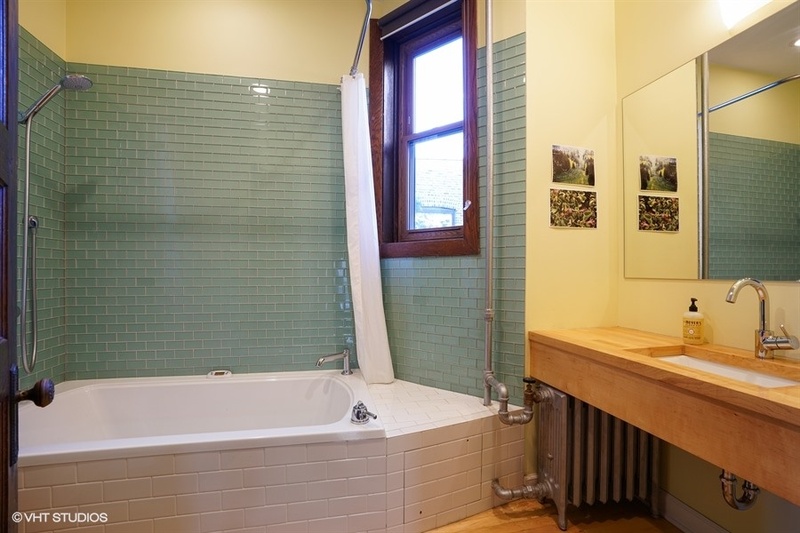 Professionally-managed and well-maintained classic brick and terracotta courtyard building. 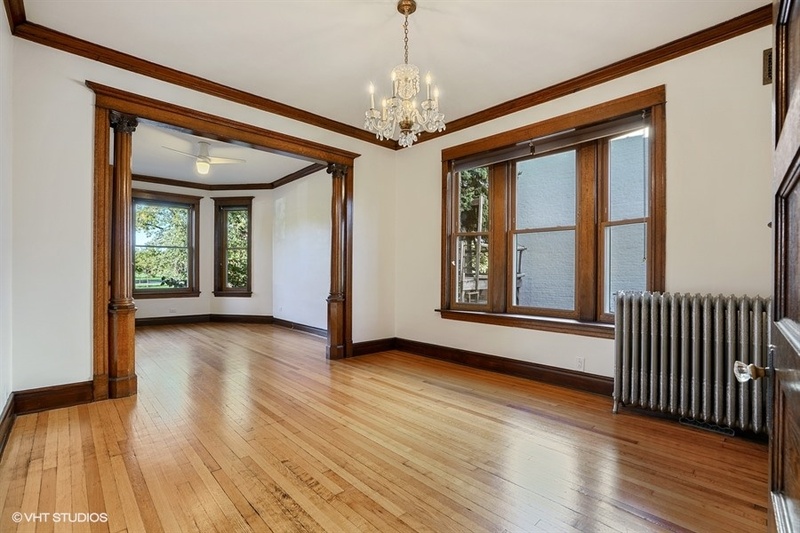 Warm cherry hardwood floors and quality finishes throughout. Living room with cozy gas fireplace and thoughtful built-in shelving open onto a dining area overlooking the peaceful landscaped courtyard. 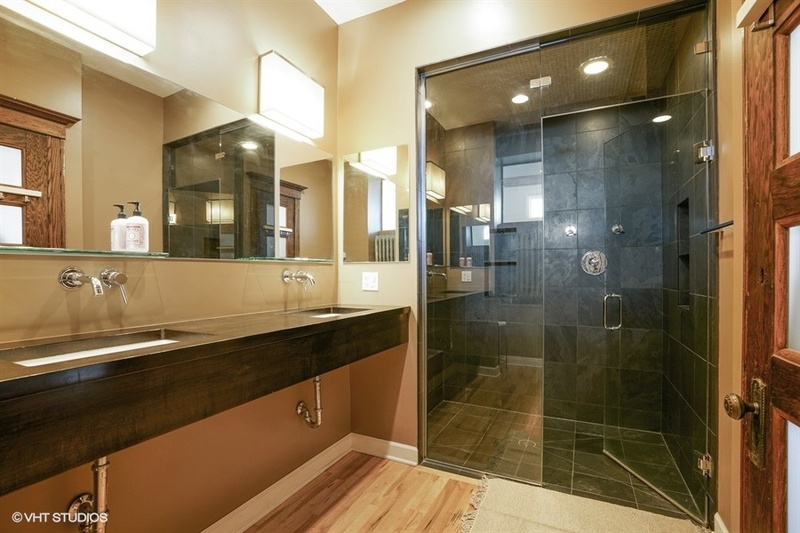 Bathrooms have granite counters and marble tile, with a whirlpool tub and shower in the en-suite master bath. Large closets and hardwood floors continue in the bedrooms. Convenient in-unit laundry. A charming haven on one of Logan Square's loveliest boulevards, with restaurants, parks, and public transportation right outside. Offered at $300,000. Open House Saturday, September 15th, 2018 1 to 3 pm. Contact Susannah Ribstein at 708-207-6590 or susannah@livingroomrealty.com for questions and showing requests. This is a rare opportunity to own this stunning 5 bedroom/4.5 bathroom limestone Tudor on an expansive 100'x125' lot in historic South Shore, blocks from the Lake. This home is a perfect combination of gracious vintage style with thoughtful modern updates. The welcoming foyer leads to a grand living room with marble fireplace, opposite a spacious dining room with original leaded glass windows. 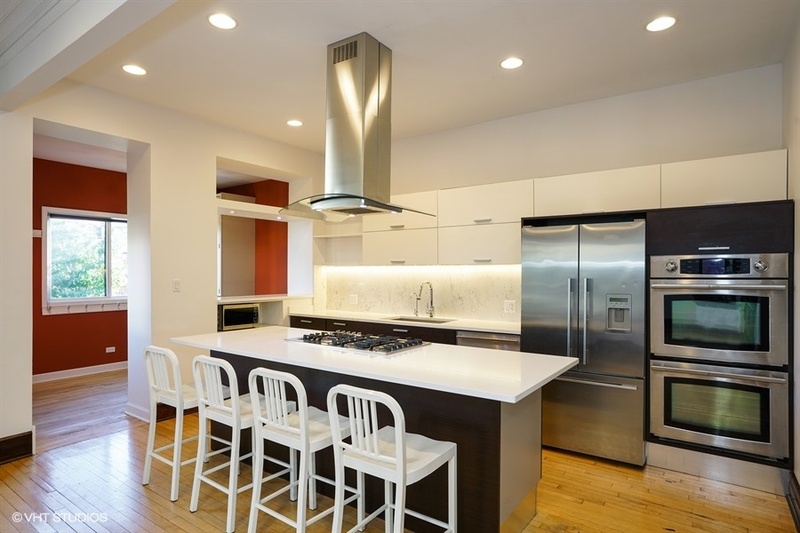 The eat-in kitchen is tastefully done with ample storage, granite, Viking & Bosch appliances. Updated entertainment room & brand-new full bath complete the ground floor. Two large en-suite bedrooms upstairs, one with a separate entrance. Master suite has a large bath with a tub. The original finished attic is perfect for a light-filled studio or rec room. Full semi-finished basement with gas fireplace is ready for your ideas. Professionally landscaped yard with patio and a 3-car garage with access for a roof deck. Just outside the front door: Metra, Lake Shore Drive, South Shore Cultural Center, Jackson Park, Obama Center site & more. Offered at $485,000. Open House September 8th, 2018 from 12-2 pm & September 9th, 2018 from 1 to 3 pm. Contact Susannah Ribstein at 708-207-6590 or susannah@livingroomrealty.com for questions and showing requests. Join us at LivingRoom Realty on Saturday, September 8th from 7-10pm for the opening of Derek Erdman's A Young Person's Guide to Hot & Sour. A series of paintings and objects about right and wrong. For more information on Derek's work, please visit his website. Please join us at LivingRoom Realty for the last opportunity to see the Joshua Lantzy's Carnival of Amateurs at the closing tea on Monday, September 3rd, from 12 - 6 PM. RSVP for this event on Facebook and for more information about Joshua Lantzy's work, please visit his website. Join us at LivingRoom on Saturday August 18th from 7-10pm for the opening of Joshua Lantzy's Carnival of Amateurs: stories of making told through drawings and objects, mythology and metaphor. You're going to love living here! 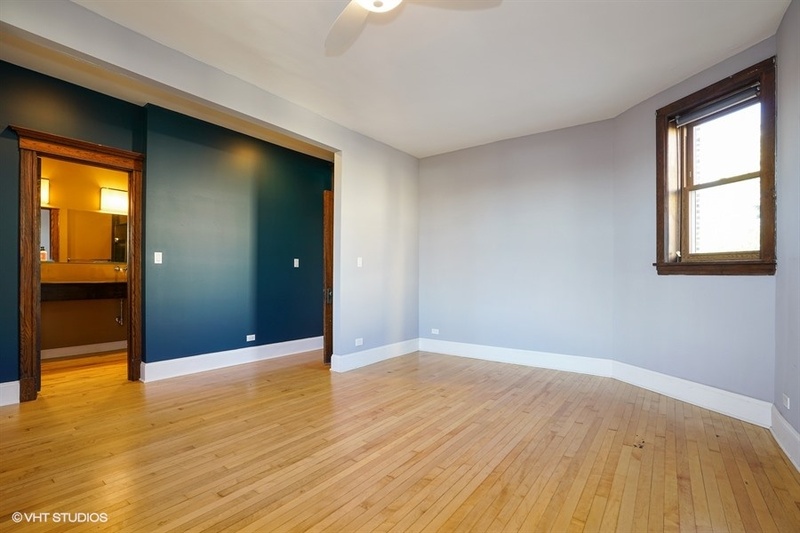 Enjoy southern light & timeless finishes in this 3 bedroom/1.1 bath renovated home that is a wonderful mix of modern layout & classic Oak Park charm. Open concept kitchen & dining w/ large island, stainless farmhouse sink, white shaker cabinets, upgraded appliances, & pantry. Living room features built ins & electric fireplace w/ tasteful stone surround. French doors separate living room from lovely sunroom/office. A mudroom that leads to/from yard & 1/2 bath round out the main floor. The 2nd floor features 3 larger bedrooms & full bath. 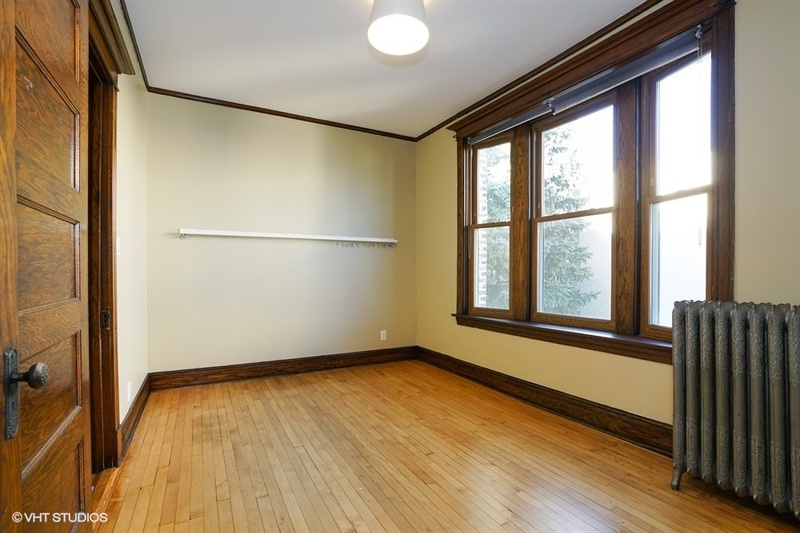 There is room in spacious master bedroom to add a 2nd bath if so desired. Finished attic is a perfect kids play area. The lower level has a family room, work & laundry area. Home sits on large lot w/ fenced back & side yard. Garage contains new 220 volt for electric car charging. 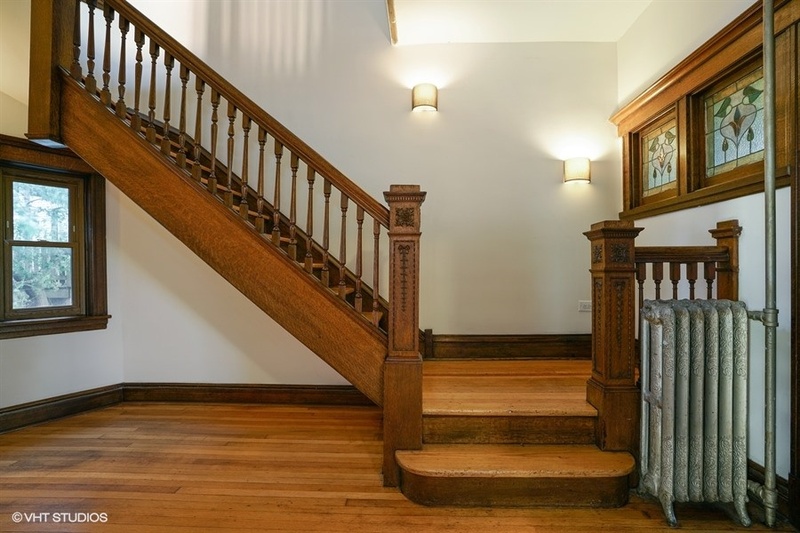 Perfect Oak Park Location. 2 block walk to Longfellow. 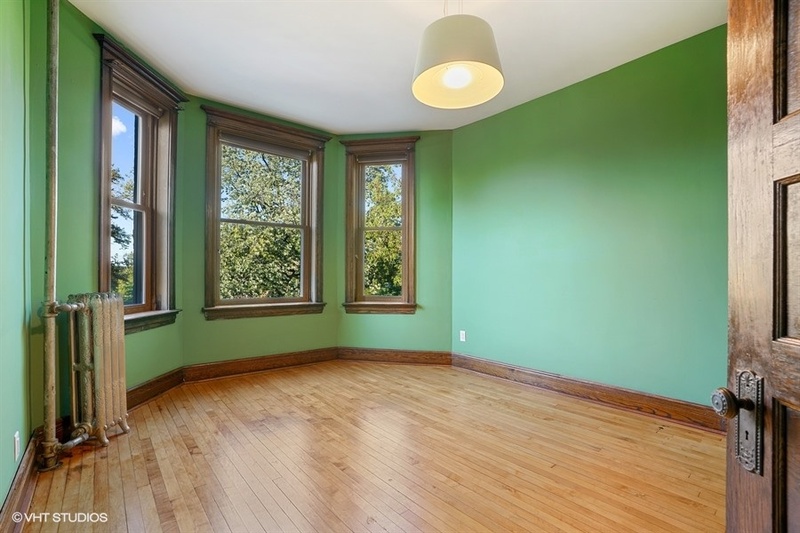 EZ walk to blue & green line, Harrison Arts District & Sugar Beet Coop & More. Offered at $549,000. Open House May 5th from 11am-1pm. 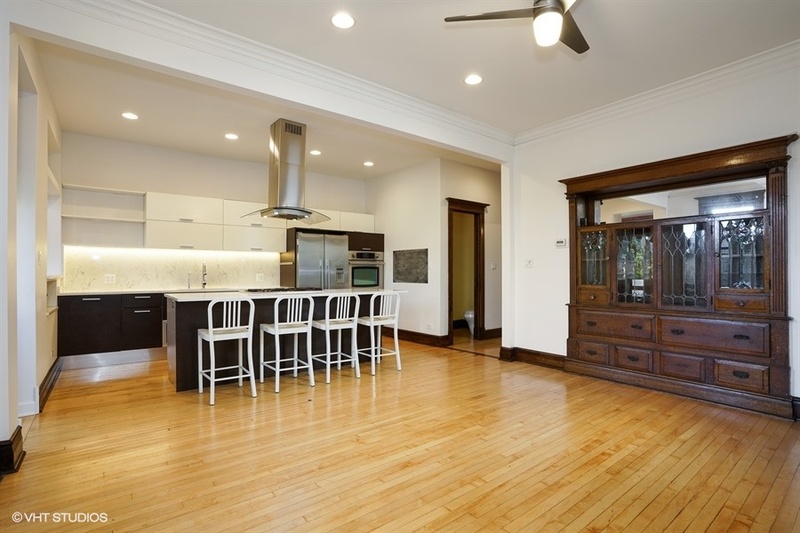 Contact Annie Coleman at 312-371-9293 or annie@livingroomrealty.com for questions and showing requests. ​LivingRoom presents “In the Phantom Tongue of the Mountain Witch,” an exhibition of ​art​work by Duncan Robert Anderson and David Shannon Harrison. LivingRoom Realty is pleased to present the opening of In the Phantom Tongue of the Mountain Witch: Duncan Robert Anderson and David Shannon Harrison on Friday, May 4th, 2018 from 7 pm to 10 pm. The event will be located at LivingRoom (1530 W. Superior St.) in the Noble Square neighborhood. “Duncan Robert Anderson and David Shannon Harrison, friends and fellow makers of many decades, both hail from the heart of the Mountain Empire. Perhaps coming of age in a place where iconic figures like Daniel Boone walked in flesh and blood makes you more attuned to the intrusion of myth and magic into lived experience; these works are redolent with the possibilities of Presence for better or for worse. But it bears remembering that a figure like Boone, now emblematic of the Appalachian genius locii, an avatar of a geography of legend, was himself a sojourner: born in Pennsylvania, died in Missouri, west of Mississippi, he hunted the Colorado Rockies in his old age. In the same sense, Anderson and Harrison’s dedication to and inspiration from their mountain home is not parochial but expansive. Anderson has carried forth this spirit to new realms, physically relocating to Chicagoland, and thematically connecting his world-weary mountaineers to new realms and new experiences, resulting in the weird hybrid pantheons of contemporary cultures in motion. Harrison, while physically ever more deeply emplaced in the headlands of the Valley of the Tennessee, has drilled down to discover veins of meaning that resurface in distant allusions. His strata of reference embed the origins in Deep Time of images and concepts that are nonetheless framed (sometimes literally) by local materials. Follow Duncan on Instagram at @duncanrobertanderson, and learn more about his and Shannon's work below.